I had been to Santiago 18 years ago with a friend just on a day trip from Porto, I remember walking through one of the little side roads and into the huge Santiago square, looking up at the Cathedral and being so blown away by the grandeur, the sheer scale of this cathedral needs to be seen to be fully appreciated, it was so beautiful that I haven’t stopped thinking about it since and couldn’t wait to show Grant and the boys. So on that first evening as we were walking through the little busy side road and I could see the top of the cathedral, I had tears in my eyes, I was so excited about seeing the cathedral again then I spotted some scaffold, as I got closer I found myself begging it not be on the cathedral, when we got to the square and saw that a large part of the front was covered in drapes and scaffold I did feel extremely disappointed. I know this work needs to be done and I did try shake off my selfish thoughts. The next day when we got to properly walk around again I realised I was being silly, the whole cathedral is AMAZING, I don’t know how else to describe it, I had those tears in my eyes again, this is the only building that has moved me in this way to that extent, It is a truly magnificent site, if I didn’t have the boys with me I think I could happily sit here all day just admiring it’s beauty, architecturally it’s something almost beyond description in its abundance of details. I could happily watch the pilgrims turn up after their long walk from wherever to feel relieved and proud that they had made this journey. Santiago de Compestela is infused with history and tradition, this whole area is impressive, to see Santiago is a must. Again our most favourite thing to do was get lost, a bit of a habit and we love it…find little streets that you feel that only you have found. It was funny one day, we found a gorgeous open stone window hole, and Grant was there trying to line up the perfect photo, he had the cathedral in the background, he said I wonder if I’m the first person to have photographed though this window, to hear a lady walking the other way, she stopped at the window and said to her friends, I remember taking the same photo through this same spot 10 years ago…So I guess Grant wasn’t the first, and i’m quite sure she wasn’t the first. Santiago at night has a whole different atmosphere the streets are packed and you pretty much have to shuffle down with the crowd’s of tourists all trying to decide where to stop to have dinner or a drink, you have to learn the art of ducking and diving which I have mastered working in London all those years. The drinking bars, tapas bars and restaurants are heaving. The lights in the skinny streets give a mystical eery feel and you just want to be a part of it all…the atmosphere is catching, unfortunately for us, we just have to gaze in the drinking bars and remember what those days were like.. Inside is opulent, breath taking and incredibly detailed. If you actually sit down and think about the craftsmanship, how old this cathedral is, and all the pilgrims that walk for days to get here it will leave you feeling quite emotional and we are not religious but can fully appreciate and understand the meaning in this cathedral to those who are. There are different magnificently detailed chapels all around the main altar for services in each language, there are confessional’s with signs for the different languages. It’s incredibly busy with tourist’s taking photos or selfies, people in the confessionals, services going on in the chapels, or just people sitting and admiring or praying.. I read that you should attend the Pilgrim mass, this mass is held at 12 noon each day, and people say that it will move you no matter what your religious preference. It usually includes the swinging of the Botafumeiro, “The Botafumeiro is a famous thurible found in the Santiago de Compostela Cathedral, in the past similar devices were used in large churches in Galicia. Incense is burned in this swinging metal container, or “incensory”. The name “Botafumeiro” means “smoke expeller” in Galician. We didn’t do this but again maybe next time we will. 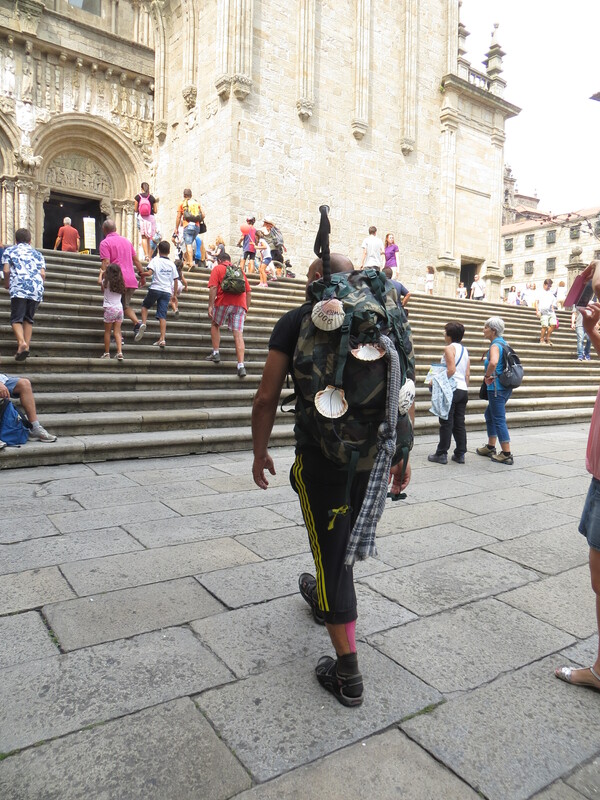 The scallop shell symbol is everywhere in Santiago along with the yellow arrow, to guide pilgrims heading to Santiago de Compostela along its many different routes. You will find them embedded in the pavement and can apparently find them painted on trees, sidewalks and tiles, the scallop shell help’s travellers find their way to Santiago. The scallop shell was practical with it being shaped like a cup it was used for drinking water, or used as a bowl for eating out of, the shell was also used by pilgrims of long ago for these functional purposes. “The pilgrim carried a scallop shell with him, and would present himself at churches, castles and abbeys, where they could expect to be given as much sustenance as he could pick up with one scoop. 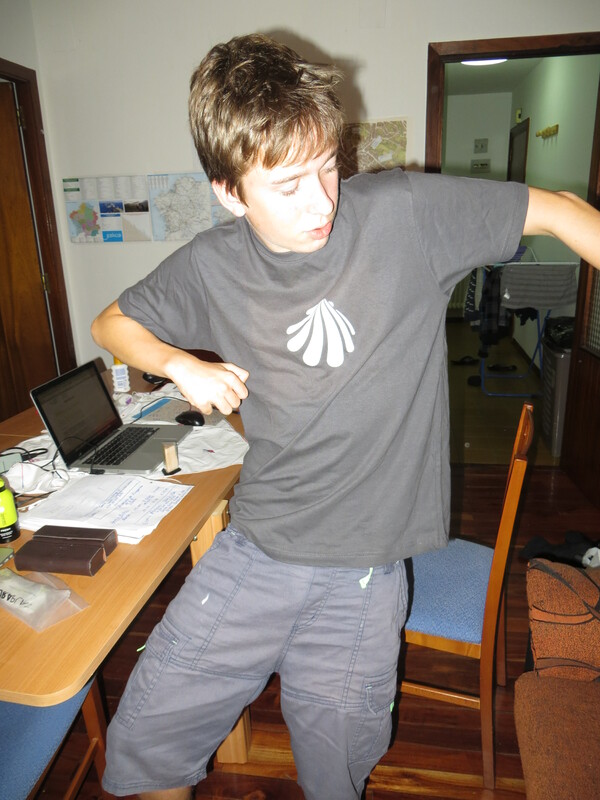 The shell is even more commonly seen on the pilgrims themselves. Most pilgrims receive a shell at the beginning of their journey and either attach it to them by sewing it onto their clothes or wearing it around their neck or by simply keeping it in their backpack. 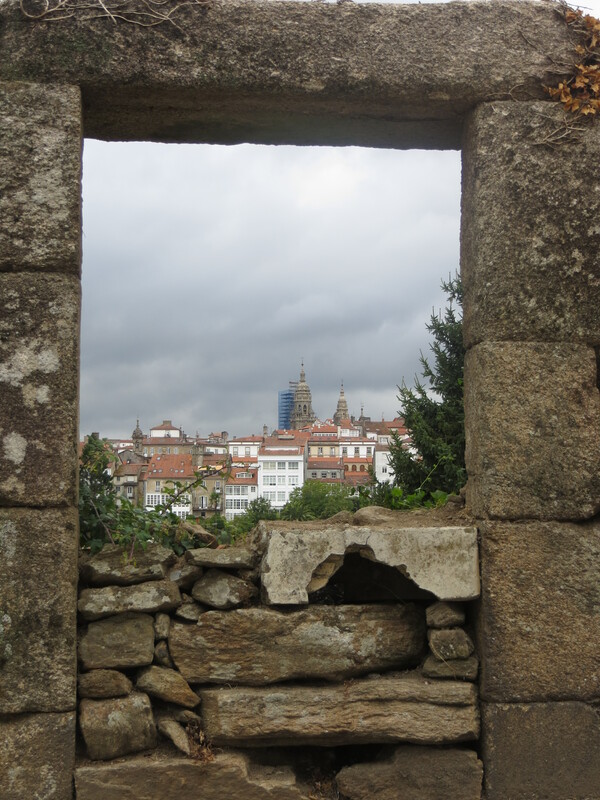 I admire the Pilgrims, and can imagine how proud they must have felt after completing the walk and reaching Santiago. You can see Scallop shell design jewellery, scallop shell T Shirts, you name it if they can put a scallop shell design on it they have. 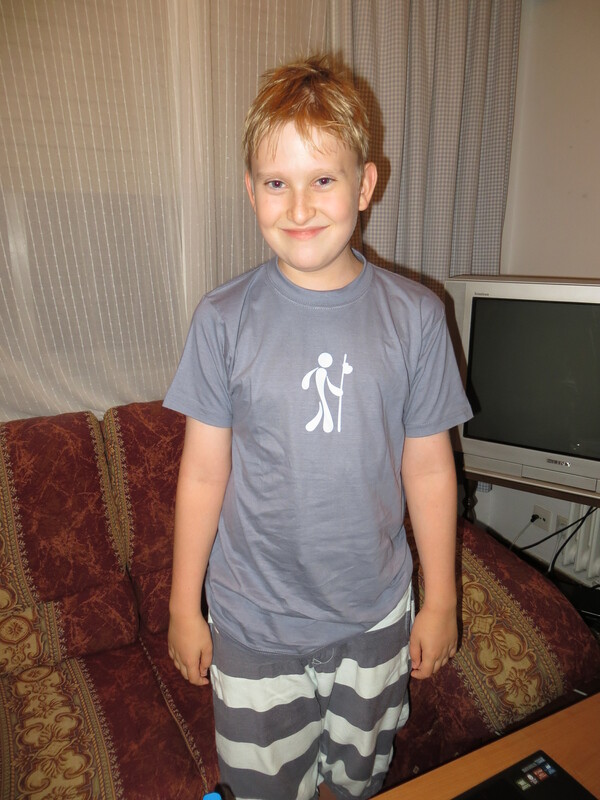 We actually got a T Shirt each for the boys as a souvenir of Santiago. When I’m hungry I only like eating things that I know or nothing too unusual anyway, but when I’m not starved I’m willing to give new foods a try, so we popped out one eve and had a few interesting local specialities, the one that we really wanted to try was the scallop, not sure we ended up ordering it done in the best way, as later on we were chatting to a very nice taxi man and he said ohh did it have breadcrumbs over it? apparently this dish is in a wine flavoured cream sauce is served in a scallop shell and named after Saint Jacques, but ours wasn’t in cream 😦 but a gravy coloured sauce with bits of Octopus, it wasn’t the dish I thought we were ordering but it was a scallop all the same, I liked it, but I am terrible at eating with my eyes, the taste was good, but there were bits I couldn’t eat, Grant was happy as he got to eat all my leftovers. We had our Scallops in a very busy little restaurant called `Bar o Barril Vinos Do Ribeiro‘ here we also had Octopus with paprika which was exceptionally soft with a smokey flavour, I liked it and could eat it if I took every tiny bit of tentacle off.. If in Santiago you must have Tapas from the very popular A Taberna do Bispo, right opposite the ‘Bar o Barril’ the selection is really extensive, and all looked divine. We tried a few Tapas selections, the little deep fried green peppers really were delicious, actually all the tapas that we had were really good. We had to try the tourist train again, Lucas loves them, it picks you up in the Cathedral Square, the queue is huge and they will make sure every seat is filled, so we ended up two of us at the front of the train and two at the back, the tour was in Spanish and English and if I could hear everything that was said would have probably learnt a lot but it was really hard to hear. Being at the front we couldn’t see much, as our view was restricted by the “Locomotive”. Still it was cute waving to all the littlies outside, and later on we went in search for a few of the buildings and streets that we had spotted from the train. Overall we wouldn’t recommend it. If you have young kids who just have to go on it, maybe just send one adult and give the other a break, the route often felt like we were in mundane parts of town, every now and then you glimpsed something worthwhile but honestly we had better experiences of Santiago walking it at our leisure. I know some aficionados would curse us for saying so but perhaps a tuk tuk tour should open up here, or better yet something a little more in keeping with the pilgrimage, donkey tours perhaps? These sites and views are the main reason we do love to get lost, but Jake and Lucas were ready to tackle their Dad, as they were just wet and desperate for their treat. The boys could see the light at the end of the tunnel and we arrived at the Ice Cream shop, Jake and Grant went for Cheesecake flavour drizzled in white chocolate, Lucas went for Banana Ice Cream dipped in white chocolate and drizzled in dark chocolate, I went for coconut Ice Cream dipped in dark chocolate and drizzled with Hazelnut chocolate sauce. There were a few things that we wanted to do but didn’t get to do because of one thing or another, the roof top tour was on our list, but you had to queue at 10.30AM in the morning, and because of the `Rayner Time Zone‘ this made it 8.30AM and with Grant working the night before and making sure we got school work done it didn’t really work out, plus I guess the weather wasn’t fantastic and as, in my head, I have already said we will be back once the scaffold is taken down in a few years, we’ll do it next time. We stayed in a lovely old apartment that was just over a 5 min walk to the start of the old Town. Ignacio kindly picked us up from the train station, his daughter was waiting at the apartment, she spoke perfect English and they both gave us heaps of information about Santiago and had maps and pamphlets on things to do around town. This apartment had 4 bedrooms, Jacob loves having his own room so he was very pleased. It was very clean and had everything we needed. Cost NZ $707 for 8 nights = roughly 297.00 pounds for the 8 days.